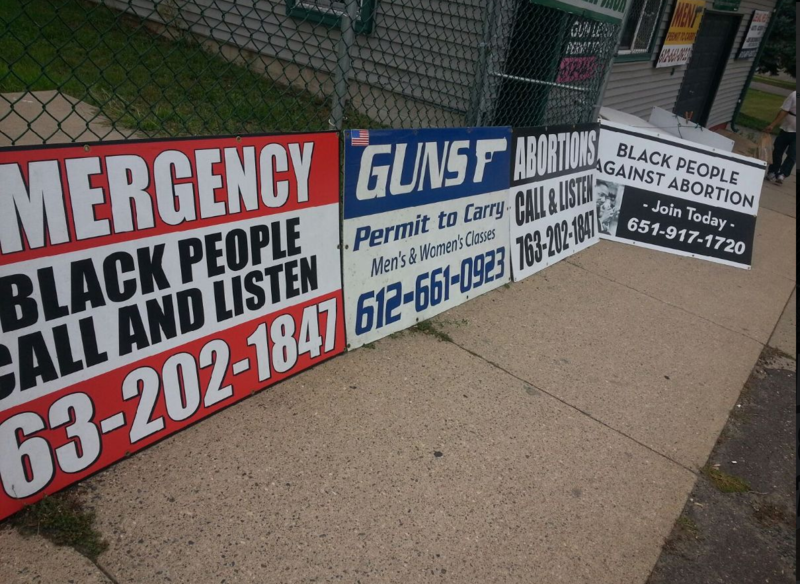 The St. Paul City Council refused Lucky Rosenbloom’s legal right to a hearing after the city issued a citation for signs placed in front of his business in St. Paul. Lucky faces criminal charges but they have denied his right to appeal and his right to a hearing on three occasions. Notice of hearing date. 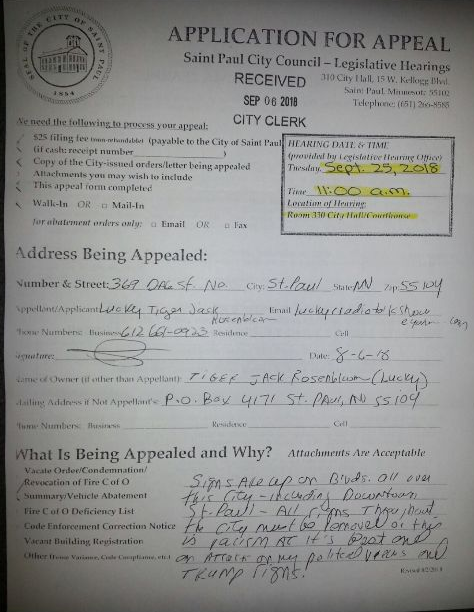 In the event that an appeal is filed, the city clerk shall mail a notice of the date, time, place and subject of the hearing to the owner and known responsible parties. The city clerk shall also mail the notice to a citizen participation district council for the district where the nuisance is located requesting that it notify the surrounding property owners and occupants. The city clerk shall also notify the enforcement officer. Lucky’s application for appeal was received by the City Clerk on September 6, 2018 and a hearing was scheduled for September 25 at 11 a.m. Upon arriving at City Hall, Lucky entered the City Clerk’s office to ascertain if he was on the schedule. Check out our video as Lucky politely confronts the City Clerk. After being denied his right to a hearing after filing an appeal, Lucky enters St. Paul Mayor, Melvin Carter’s office to file a complaint. “This is conduct unbecoming of a public official,” he said. 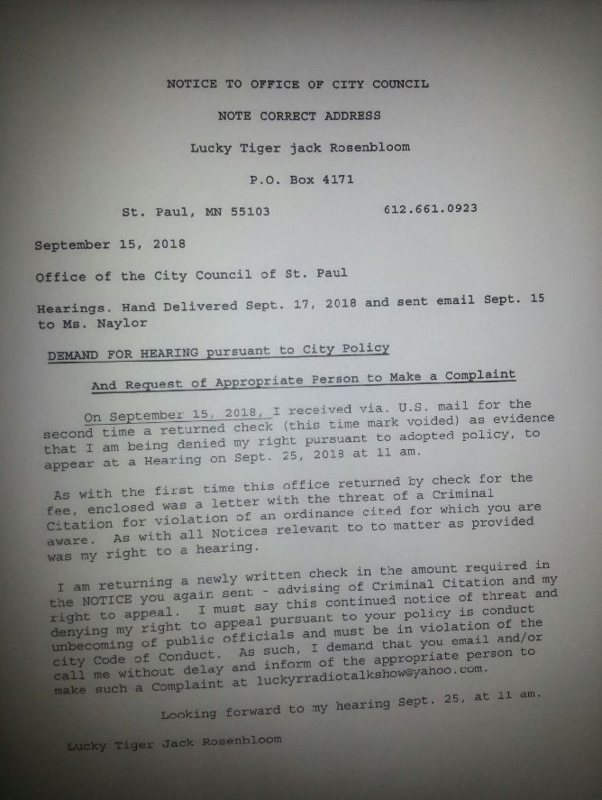 After being denied his right to a hearing, Lucky speaks out about the intimidation tactics used by the City of St. Paul. 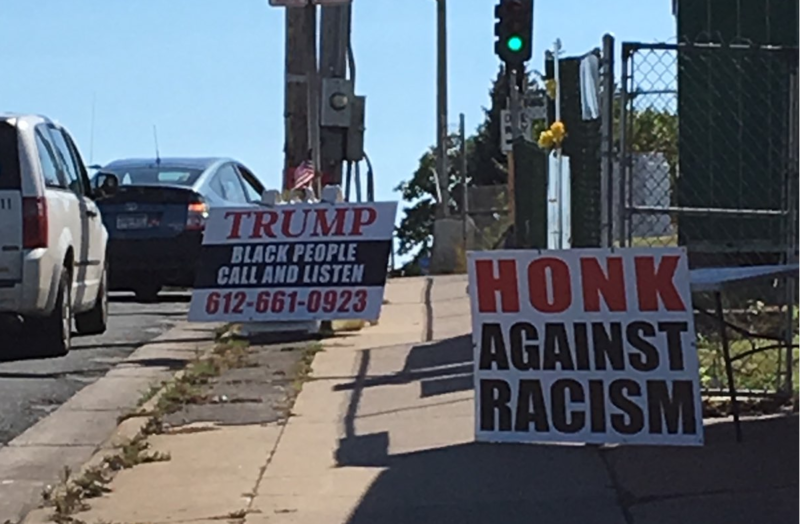 St. Paul, Minnesota Icon, Lucky Rosenbloom, faces criminal citation for conservative signs placed on the boulevard at 94 and Dale. The St. Paul City Council are refusing to hear his appeal. Lucky Rosenbloom is no stranger to controversy. With a booming voice, a big personality and a heart to match, Lucky is an outspoken advocate for African Americans. With a God-given mission to fight racism, Lucky’s message to black men that they are powerful and self-reliant is causing liberals in St. Paul to quiver with fear. Lucky’s parents are a legacy in St. Paul’s Rondo neighborhood. His dad, Tiger Jack, was hard and sharpened his children like iron. Tiger Jack’s business sold everything from charcoal to Christmas trees but he offered advice and a friendly wave for free. His mother, Mrs. Tiger, was soft despite having suffered racism in her native Mississippi. Lucky and his seven brothers and sisters grew up hearing stories of Jim Crow Laws, sitting at the back of the bus and being forced to say “yes sir” to whites. These were the dark days when black people were not treated equally under the law. 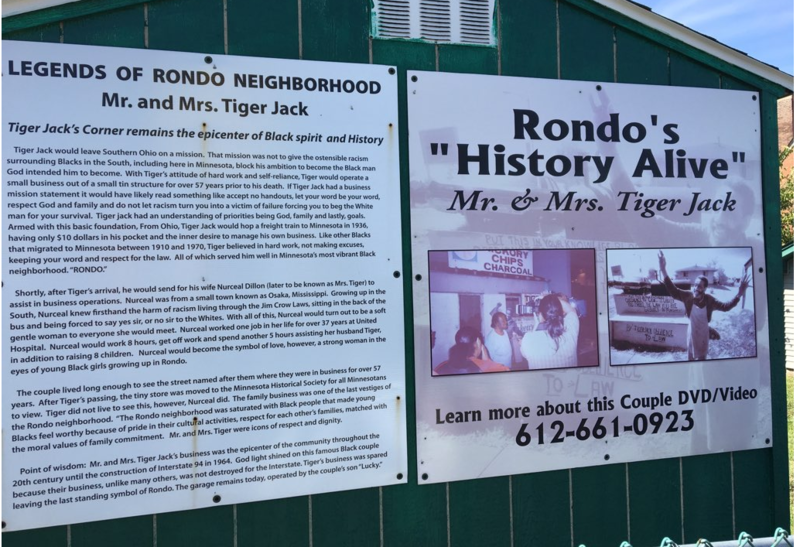 The couple worked long hours and became a symbol of love and strength in the Rondo community. A “nuisance” shall mean any substance, matter, emission or thing which creates a dangerous or unhealthy condition or which threatens the public peace, health, safety or sanitary condition of the city or which is offensive or has a blighting influence on the community and which is found upon, in, being discharged or flowing from any street, alley, highway, railroad right-of-way, vehicle, railroad car, water, excavation, building, erection, lot, grounds or other property located within the city. The city responded by scheduling a hearing for September 25 at 11:00 a.m. then, without warning, cancelled the hearing and said the case was closed. The written notice included the original complaint stating he will face criminal citation if the signs weren’t removed. Lucky tried to appeal, as is his right under city code, a second time. His check was returned again with the original complaint enclosed. Refusing to give up, Lucky hand delivered the letter below along with another $25 check. “I am returning a newly written check in the amount required in the NOTICE you again sent – advising of criminal citation and my right to appeal. I must say this continued notice of threat and denying my right to appeal pursuant to your policy is conduct unbecoming of public officials and must be in violation of the city Code of Conduct,” states Rosenbloom in the Notice. We will be reporting live on September 25 from St. Paul City Hall. Will Lucky receive his hearing as per city code? 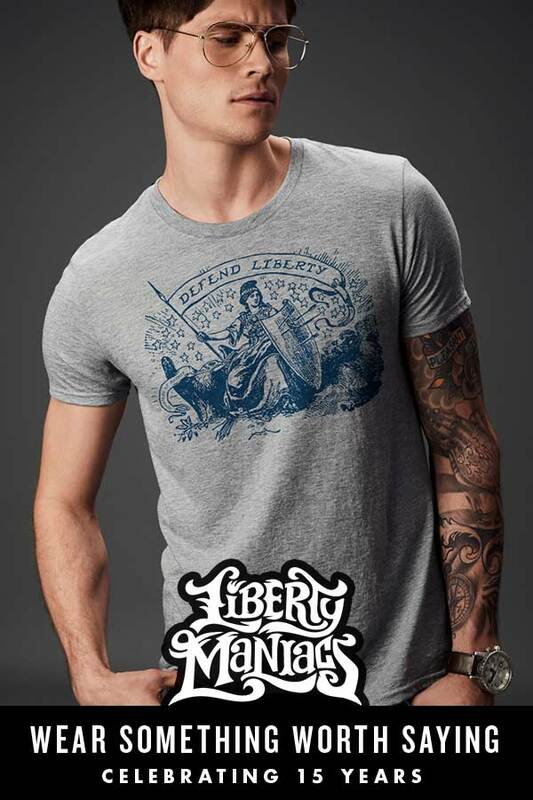 Please check out our interview with Lucky below.